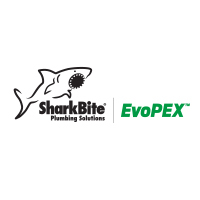 The SharkBite EvoPEX system is an evolutionary push-to-connect plumbing system for new construction that extends beyond the traditional pipe-and-fitting solutions to be inclusive of fittings, PEX pipe, outlet boxes, valves and other accessories needed to install a complete plumbing system from meter to fixture. Installers are able to plumb an entire potable water pipe installation without needing special tools. As a result, productivity is increased, allowing jobs to be finished faster, while reducing the risk of installation errors that could cause potential leaks.